In one of the recent wardrobe posts, I wrote that the wear-at-home side of my closet needed its own capsule. And it does. I’ll spare you the gory details. Suffice it to say that the need is dire and I have taken the first step to fill the gaping hole. I’m thinking two pairs of jeans and 4-6 tops. I’m starting with the jeans because I wanted to try Angela Wolf’s pattern. I scooped the front crotch curve ⅛”. Then I cut it in stretch denim to make a wearable prototype. That’s what you see in these pictures. For this particular pair, I taped the back yoke to the jeans back piece – there’s no shaping involved, just a straight line, and no grain change either so this was okay and it allowed me to position the pockets higher. I omitted the belt loops because the stabilized curved waistband will stay put without the help of a belt. I am not too keen on the amount of wrinkling on the back of the legs. I’ll see if I can fix some of that in the next version. Otherwise, I am pretty pleased. The pattern has very detailed instructions, which I followed almost to the letter. I used regular white Metrosene for both seaming and topstitching. No doubled thread here. I think it shows just fine. The serger was threaded with blue from a previous project so I just used that. I opted for a contrast waistband facing, using the same bright green quilting cotton that lines the pockets and serves as the fly shield. I’m not entirely sure about the stretch denim. It feels weird, how it moves with the body. I think I prefer regular non-stretch denim. There should be a few yards coming in the mail soon. That said, this pair is perfectly wearable for around the house. There’s so much more I wanted to tell you but the words aren’t coming because my brain is ready for the movers. They’re coming tomorrow. It’s a local move so somewhat less stressful than our usual transatlantic move but still far from fun. I expect to be unpacked and fairly functional early next week. And now I’m off to pack up my machines because I don’t want anybody else’s paws touching them. Thank you, Marcia! I took Angela’s Craftsy class as well, and yes, lots of distressing there. I really enjoyed her tips on topstitching and other bits that make jeans look like jeans. Jeans look great! Good fit. I made a white jean out of stretch denim and did find that it gave more than expected and I was soon holding them up. Hope you do not have the same experience. Thank you Nana! I’m sorry to hear about your growing jeans. That’s never much fun. Angela recommends sewing a non-stretchy twill tape into the waistband seam (where it meets the waistband facing) and I did that. That part is definitely not going to stretch. We’ll see about the rest of the pants. You are so talented. It’s fun to see your work. Both grandmothers and a great grandmother were similarly gifted: my great grandmother could look at a dress, cut out a newspaper pattern, and make it. Wow. Wish I had picked up the needle, but my attempts only annoyed my teachers. And me. That said, I was interested in your comments on stretch denim. I’ve come to hate it. Seems you have to get jeans too small and then let them stretch out. Otherwise, they always seem to bag. I look forward to seeing and hearing about your regular denim jeans. Thank you Amy! It sounds like your great grandmother had some really impressive skills! Oh how I often wish to be able to go back in time and learn from people like that. I have the AW pattern but have not tried it yet. Yours looks great! Thank you June! Please post when you try the pattern. We could compare notes, hehe. Hi – I had similar wrinkles in the back of pants and my sewing teacher said to add to the back inseam, tapering down the leg. That may help you. Thank you Brenda! I’ll try your suggestion and see what happens. I love these! 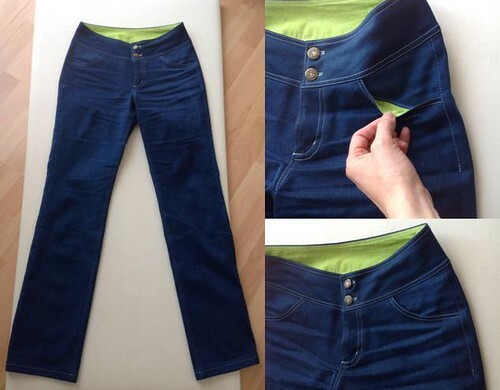 Perfect jeans pattern is the Holy Grail of sewing! The waist band fits perfectly, great job.